Sakai Community DocumentationSakai 12 Administrator Guide (English) User MembershipHow do I make a user active in multiple sites? Note: If desired, you may also filter your search using the User Type or User Authority drop-down menus. All matching users will be displayed in the search results. Click on a User ID to see site and group membership for that user. Zoom: Click on a User ID to see site and group membership for that user. Note: Clicking on the title of a site will take you into that site. 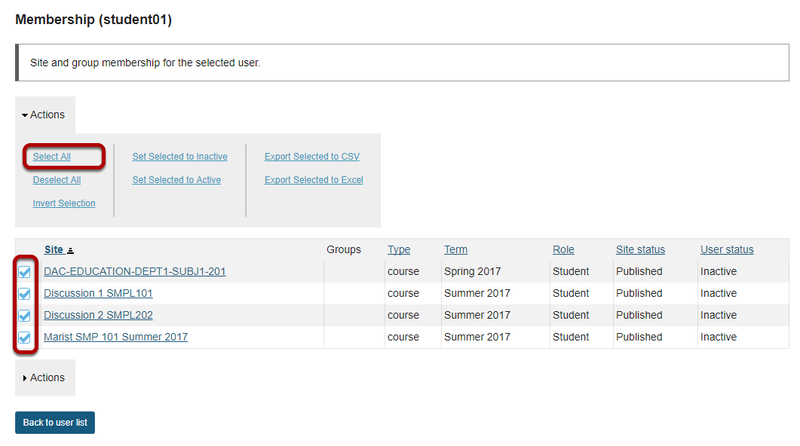 Select some or all of the user's enrolled sites. Zoom: Select some or all of the user's enrolled sites. You may select all or some of the user's sites by using the Select All link in the Actions menu, or by checking the boxes next to the sites in which you want to make the user inactive. Click Set Selected to Active in the Actions menu. Zoom: Click Set Selected to Active in the Actions menu. Zoom: View user's current status. 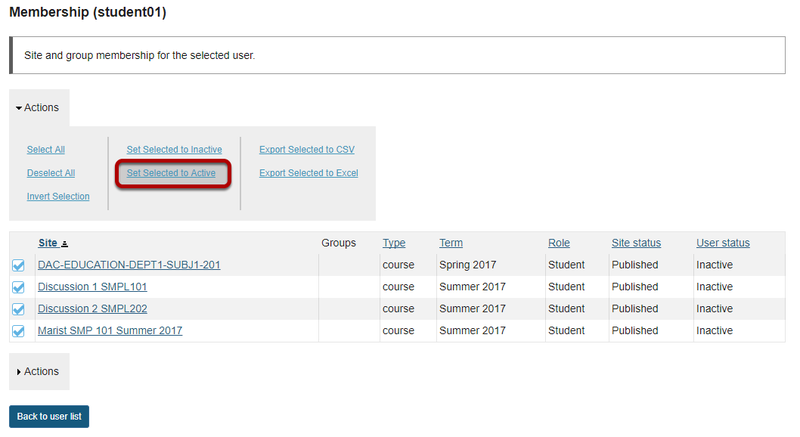 Notice that the user's status is now "active" in the specified sites. Prev: How do I make a user inactive in multiple sites?